Little Mrs. Married: Getting to know ya! I'm sorry i will have a gazillion posts today. I have recently been unable to post hardly at all during the week. And even less starting Tuesday because i will be going from work to gym to rehearsal & probably falling into bed as soon as i get home! (Because i'll be SMing a show during April.) So, weekends it is! Dayquil Sinus & a magnetic notepad for our grocery lists! 3. Would you rather watch a movie in the theatre or from the comfort of your own home? 4. Household chores you don't mind doing? The dishes. The kitchen in general. And folding laundry doesn't bother me. I like hot coffee & cold tea! I have coffee daily, but tea once a week at most. 6. What could you eat everyday & not get sick of? Hmm...french bread? Yeah. But i don't, promise!!! Magdalene, by Angela Hunt. LOVED IT! READ IT! I'm currently reading "Made to Crave" & "A Woman after God's Own Heart". 8. Do you think you look your age? 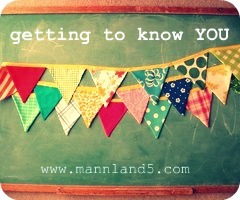 Head on over to MannLand5 & join in! LOVE your list of what inspires you :) And I think you definitely look younger than your age! In the best way! Ahhh...I used to get the young thing all of the time, apparently having two teens sorta of voids that whole idea (Being young). Oh, how. Is "A Woman After God's Own Heart"? I want to read that book. By Elizabeth George, right?